Check availability by visiting the Lazy Daisy's website above. Daisy Hill Farm offers 3 self catering cottages Each cottage is well equipped and newly built and furnished to the highest standard. Bedding and towels are provided and are changed weekly. There is a laundry with washing, drying and ironing facilities for all guests to use. 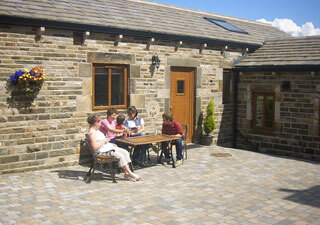 A patio area provides the ideal spot to relax and enjoy the beautiful Yorkshire countryside. Barbeque available on request. 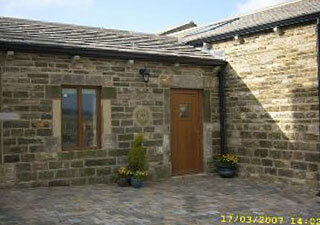 The largest of the cottages (Moonpenny) is ideal for a family get together and can sleep up to 10. The properties are non-smoking with private parking area. Daisy cottage is on a groundfloor level throughout and is fully accessible to wheelchair users with wide doorways and a wetroom with handrails. Nearby are traditional country pubs serving restaurant and bar meals. There is an Indian and Thai restaurant half a mile away. The market town of Penistone is only 2 miles away with regular farmers markets and weekly outdoor markets. 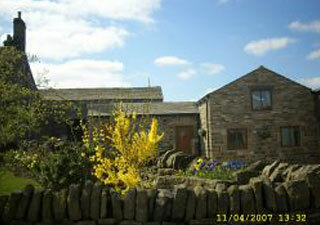 The village of Holmfirth is nearby and famed for "Last of the Sumer Wine". For excellent shopping opportunites visit Meadowhall shopping centre. And the fantastic theatres of Sheffield are within easy reach. For the more sporty Sheffield offers a dry ski-slope and the "Xscape" indoor snow slope is only half an hours drive away. Leave at jct 35a and take A616 towards Manchester after about 5 miles you wil pass through the hamlet of Langsett with a pub called the Wagon and Horses. Keep going until you reach the Flouch roundabout. Turn right towards Barnsley. We are the first farm on the right after the bend on the brow of the hill. Leave at jct 36 turn right at the roundabout towards Manchesterand the A616 then follow above directions. Take A628 Woodhead Pass until you reach the Flouch roundabout having passed a pub called "The Dog and Partridge" on your right/ Go straight on at the roundabout towards Barnsley. We are the first farm on the right after a bend on the brow of the hill. Take A616 until you reach Flouch roundabout. Turn left towards Barnsley - 1st farm on the right. Take A628 towards Manchester pass through the villages fo Thurlstone and Millhouse Green. About one mile further up a hill and round right hand bend we are on the left before you reach the Flouch roundabout. The nearest train station is Penistone. The take Bus number 20 or 24. The bus stops at the bottom of the farm lane.